In a country that’s filled with great diners, having breakfast in your hotel in the USA always seems to be a wasted opportunity for a good meal. We’ve all been there. ‘Room number? Help yourself to the buffet.’ On the buffet the scrambled eggs come in lukewarm lumps and you’re dying for a coffee but five minutes later you’re still trying to find a waiter to bring you one. America does some of the best breakfasts in the world, and the best ones of all you’ll find in diners or other simple eating places. You usually have to ask around, or consult Dr Google, but I’ve had brilliant breakfasts all within a 5-minute walk of the hotels I’ve been staying in. They’ve been twice as good and half the price of hotel breakfasts. 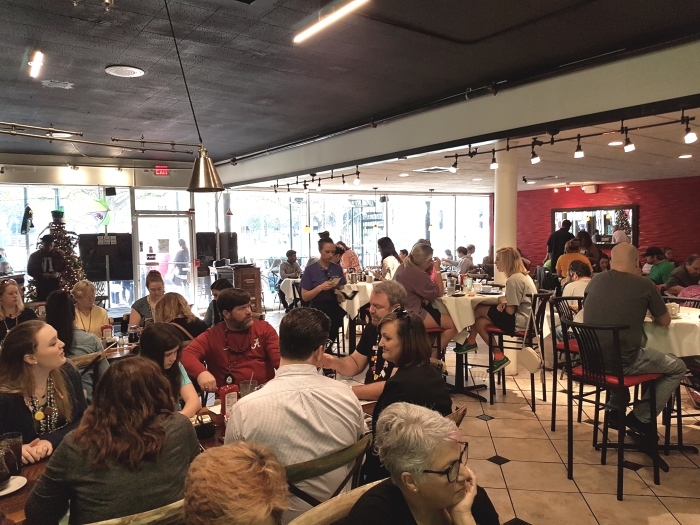 On a recent trip to Mobile, Alabama, I was able to find breakfast bliss in several places, all of them walkable if you’re staying downtown in this compact city, famous for being the birthplace of Mardi Gras in the USA. Only open for breakfast and lunch, A Spot of Tea might sound like a genteel English tea room, but walk in – if you can get in – and like all good diners it’s like walking into someone’s home. The other guests have got there before you and are already partying, but you’re instantly one of the crowd. 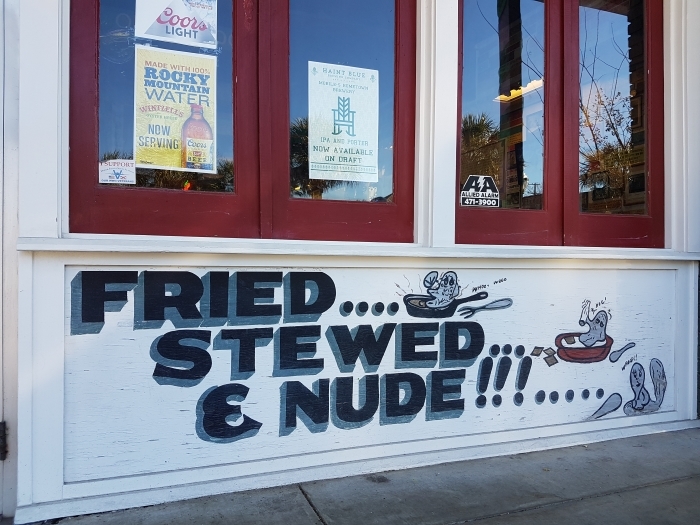 Here the Eggs Cathedral and Banana’s Foster French Toast are both included in the Bible for Alabama foodies: 100 Dishes to Eat in Alabama before You Die (available free from Alabama Tourism.) Suffice it to say that if you ate everything in the book that death would come sooner rather than later. My wife and I split a French Toast, which was topped with hot Banana Foster’s sauce, sliced bananas, pecans and sugar. This being America, you also got a side of ham, sausage or bacon. For $10 we could have stopped there, but like kids in a candy store, faced with a menu that looks and sounds mouthwatering, what can you do? 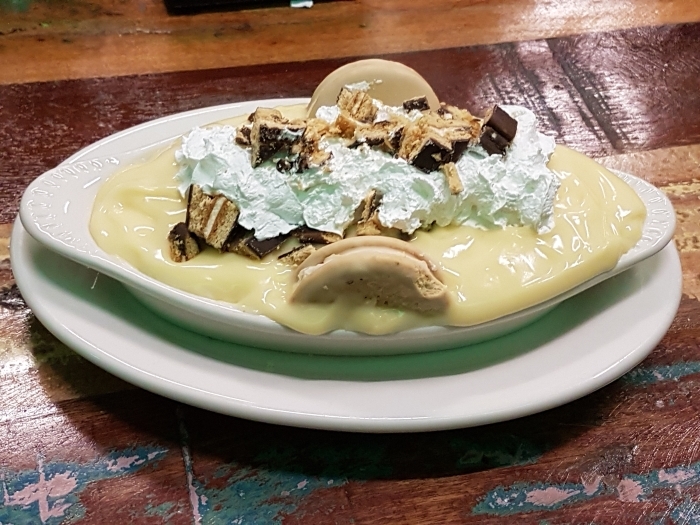 ‘We’re famous for our Moon Pie Pudding too, honey.’ Well, OK, one to share. Unfortunately the owner, Miss Ruby, was taking a day off, this being Saturday, and we didn’t get to hear the story about how her husband put their three kids through college by being a professional gambler. Now Mardi Gras is one issue between New Orleans and Mobile. 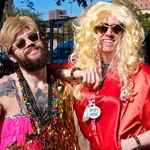 Mobile’s Mardi Gras is the oldest in the USA but the one in New Orleans is much more famous. A second issue is beignets. No visit to New Orleans is complete without having beignets and coffee at Café du Monde. It isn’t just a touristy thing, either, as locals hang out there too. 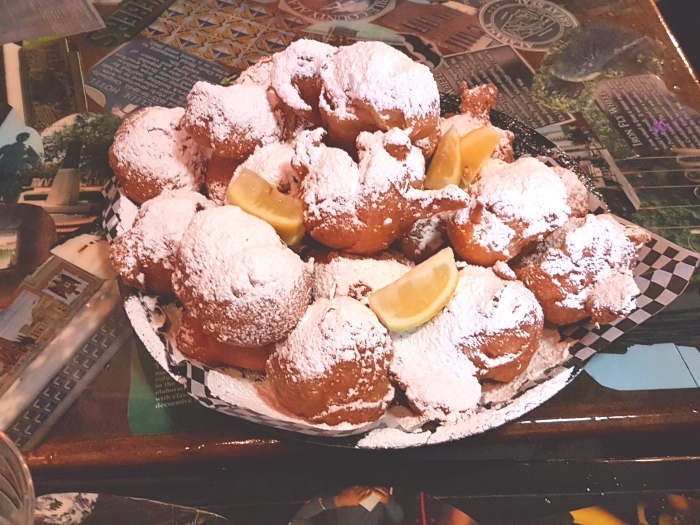 But I am here to tell you that the beignets in Mobile at Panini Pete’s are way better. The culinary science was lost on me but apparently in New Orleans they use a dry beignet process while Panini Pete uses a wet process. The result is that the beignets are succulently moist. Served with a sprinkling of sugar and a squeeze of lemon juice, they’re not unlike the great British pancake served on Pancake Tuesday, our sedate British version of Mardi Gras. This being the USA, pancakes alone do not a breakfast make. 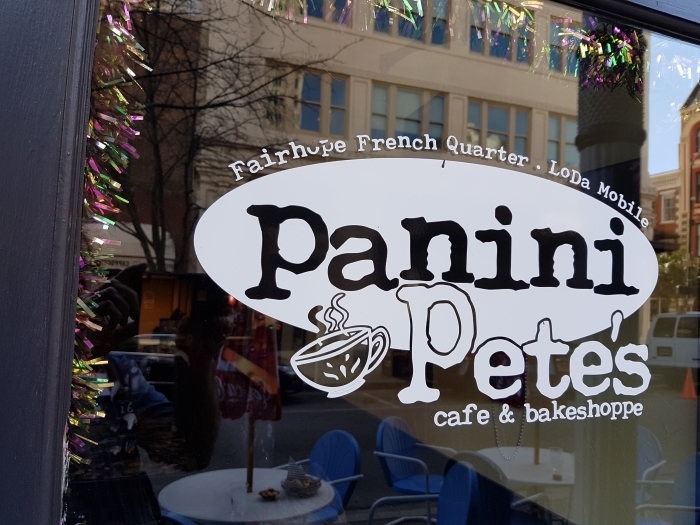 We also shared Pete’s Original Breakfast Panino: scrambled eggs, crispy bacon, vine tomatoes and melted Swiss cheese all stuffed into grilled sourdough bread. Oh, and served with fresh fruit. Who says American breakfasts aren’t healthy? 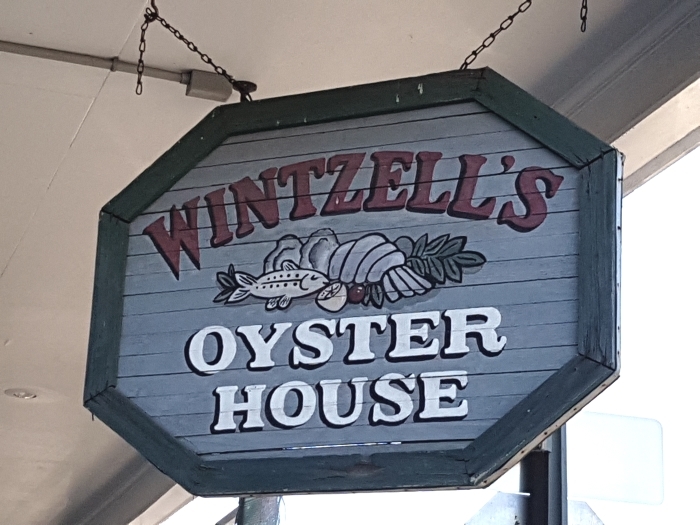 One of the most famous eating places in Mobile is not a strict breakfast choice as it doesn’t open till 11am, but if the idea of freshly-shucked oysters and cocktails for brunch appeals, then Wintzell’s Oyster House is the one. 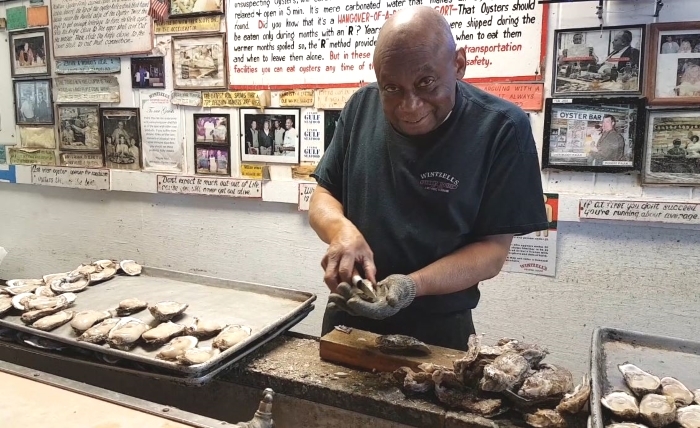 Oysters Rockefeller are of course a staple at most oyster bars, and at Wintzell’s you can watch the oysters being shucked by grizzled old guys along the side of one room. The men look like they’ve been there for decades, and probably have, as do many of the waiters. We tuck into a half-dozen Oysters Rockefeller, which Wintzell’s serves heavy on the spinach sauce and they’re creamily delicious. They’re as fresh as it gets, of course, which is what you can expect from a place that sells 182,000 pounds of them every year. A guy sitting nearby even found a pearl in one of his oysters, though as it was about the size of a pinhead he wasn’t planning big celebrations. 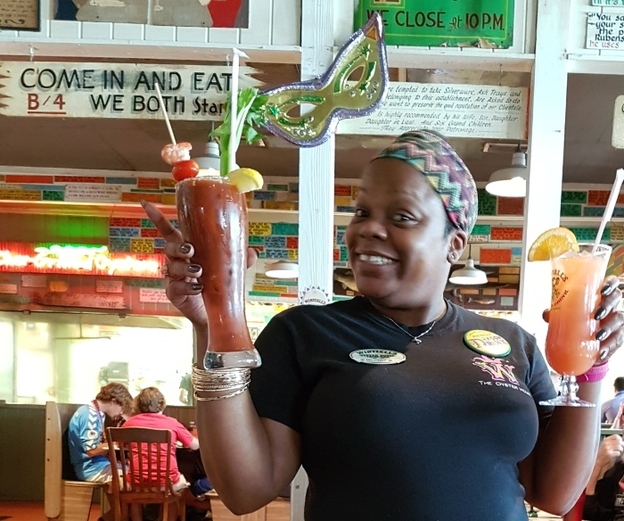 There’s just room for some seafood gumbo, and their signature cocktail, the Dragon Drink, named after one of the dragons in the annual Mardi Gras parade. It’s a fruity punch-like drink, and I never did find out what went into it, though unlike many restaurant cocktails it’s clear that hefty amounts of alcohol were involved. This is the South, after all, where booze before noon is merely a libation, after noon it’s a cocktail and only in the evening is it considered a serious drink. Another libation with brunch? I don’t mind if I do. Mike stayed at the historic Battlehouse Hotel, whose breakfast buffet he did find exceptionally good. British Airways, with American Airlines, flies to Mobile via Dallas. 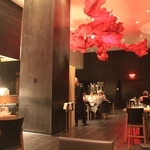 UK tour operators who visit Mobile include Audley Travel and Trailfinders.